During post-launch testing of the GOES-17 ABI instrument, an issue with the instrument's cooling system was discovered. The loop heat pipe (LHP) subsystem, which transfers heat from the ABI electronics to the radiator, is not operating at its designed capacity. The consequence of this is that the ABI detectors cannot be maintained at their intended temperatures under certain orbital conditions. 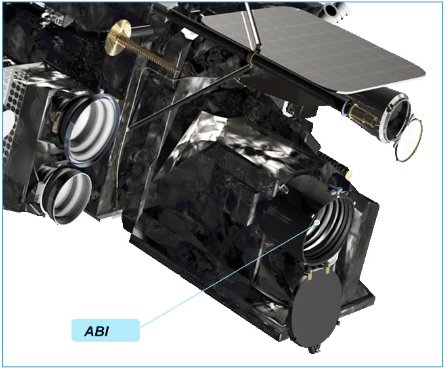 This is preventing adequate cooling for some of the infrared (IR) channels on the instrument during parts of the night, leading to partial loss of ABI imagery. During nighttime hours, centered at approximately 13:30 UTC, for part of the year, the sun heats up the ABI detectors faster than they can be cooled. The detectors become warmer than they're designed to operate, and local emissions and dark current noise overwhelm the signal from the Earth, resulting in some saturated IR channels, meaning a useful signal is not available. Channel availability will also fluctuate seasonally depending on the amount of solar radiation absorbed by the instrument. A great deal of progress has been made to optimize the performance of the GOES-17 data. GOES-17 is observing with more channels, at a higher resolution, and with more rapid refresh than what was available from the previous GOES West satellite. NOAA is confident the GOES constellation will continue to meet the operational needs of the National Weather Service and forecasters across the nation. Users may notice that some images from the GOES-17 infrared channels don't look right. Sometimes images show lots of noise, sometimes striping, and some areas missing data entirely. What is the source of this problem? During post-launch testing of the GOES-17 satellite's Advanced Baseline Imager (ABI) instrument, it was discovered that the instrument's infrared detectors cannot be maintained at their required operating temperatures under certain seasonal and orbital conditions, resulting in periodic image degradation and outages for some infrared channels. Why is cooling so important to the satellite? Why are the infrared sensors not able to be maintained at their required operating temperature? Isn't it already quite cold where the satellite orbits in space? First of all, the GOES Advanced Baseline Imager needs to be VERY cold to work properly. How cold? About 60 Kelvin, or about -350° Fahrenheit. To maintain this desired operating temperature for the ABI, the satellite has a sophisticated cooling system which dissipates excess heat from the sensitive instruments, helping them to accurately sense visible and infrared frequencies. The ABI utilizes several assemblies and subsystems to maintain thermal control of the instrument. There is a mechanical cooler that pumps heat away from the detectors to cool them to their required temperatures. The heat from this cryocooler and the instrument electronics are transported to an external radiator by the loop heat pipes. The radiator is a large reflective surface that is designed to reject excess thermal energy to space. Other components of the thermal system are blankets and shields that that protect the instrument from absorbing too much solar radiation. Investigation into the cause of the thermal performance issue concluded that foreign object debris (FOD) is blocking the flow of the coolant in the loop heat pipes. A series of ground-based tests support this finding as the most likely cause. A second potential cause, mechanical failure, was investigated and deemed unlikely. Satellite support engineers have determined that an anomaly with the ABI Loop Heat Pipe (LHP) is preventing the instrument cooling system from maintaining sufficiently cool temperatures during certain parts of the day and year. Because of this anomaly, data quality will fluctuate seasonally depending on the amount of solar radiation absorbed by the instrument. Why is the heating maximized in the overnight hours? At night the sun is on the far side of the Earth relative to where the GOES-17 ABI is scanning, so it shines directly into the ABI aperture then. During the daytime, the sun is "behind" the satellite, meaning it does not shine directly into the aperture. About 3 weeks before and after the autumnal and vernal equinox, for a varying number of minutes each night there's a period where the Earth blocks the sun (known as eclipse) and prevents it from shining into the aperture. This allows some relief from the sun and the detectors are able to cool down more efficiently. What is a Loop Heat Pipe? Are the periods of limited satellite performance related to seasons? Do they have a predictable pattern, timing and duration? Yes, channel availability will fluctuate seasonally depending on the amount of solar radiation absorbed by the instrument. During the 'hotter' seasons for the satellite, are all channels affected equally? Is data quality reduced for the entire period? Not all infrared channels are affected equally by solar heating, and the impact of heating does not occur at all times of the day and night. Different infrared bands are affected by instrument temperature at different temperatures. And in most cases, compromised data quality for IR channels occurs late at night, for periods of a few hours. During the instrument's "cool" seasons, near the summer solstice and winter solstice (approximately June 21 & December 21), all channels are expected to operate satisfactorily 24 hours per day. During the instrument's "warm" seasons (before and after the vernal and autumnal equinoxes), engineers estimate that the visible and near infrared channels (Bands 1-7) will operate properly 24 hours per day and the other 9 channels (infrared bands 8-16) will be degraded and images will therefore be of reduced quality or unusable from 2-6 hours per night. What is being done to address the cooling system problem on the ABI? Experts investigating the issue have found the most likely cause to be foreign object debris (FOD) blocking the flow of the coolant in the loop heat pipes (LHPs). The ABI radiator and LHPs are being modified for GOES-T and U to avoid the issue. The new design utilizes a simpler hardware configuration that eliminates filters that can collect FOD. Redesign efforts are underway and the Critical Design Review was held in February.